In this example, we will configure the DMA module to read data from an array stored in the RAM and write it in to the UART TX buffer. 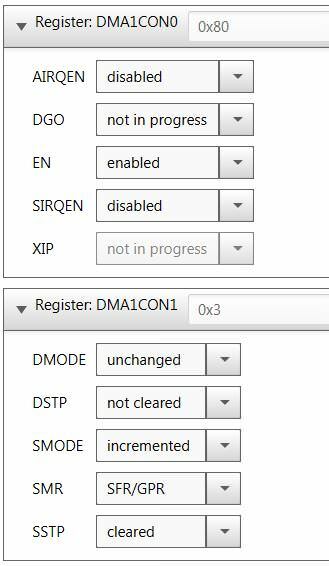 We will configure the hardware trigger for the DMA module to be the UART Transmit Interrupt, so the DMA will load the next data byte automatically. This hardware triggers allow the DMA module to wait until a byte of data is transmitted out of the TX buffer. These are the settings for the source size and address location. The source size is 23 bytes (0x0017). We will modify the generated dma.c file to provide the address of the source data array. These are the settings for the destination size and address location. The destination size is 1 byte (0x0001). i.e. UART TX buffer. 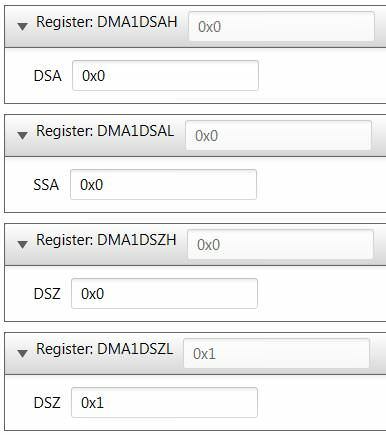 We will modify the generated dma.c file to provide the address of UART TX buffer. MCC is also used to setup the UART module as a transmitter and also to setup the I/O pins. Please open the project and MCC to look at these settings. Here is the modified code in dma.c which now has the edited source and destination addresses. The DMA trigger has been selected but not enabled. Note that enabling the trigger will initiate the DMA transfer immediately as the TX buffer is empty at start. Subsequent triggers are generated every time a byte has been sent out the TX buffer. The following line of code in main.c will enable the trigger. The data from the UART module can be observed on pin RC6. 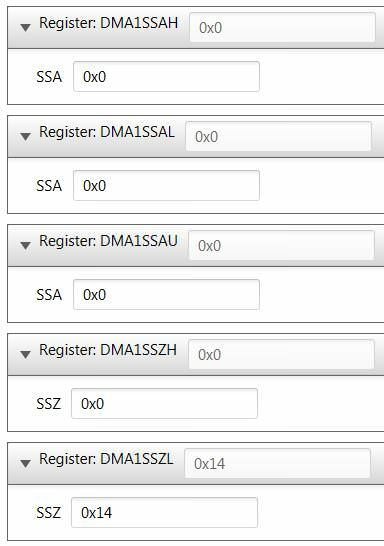 It is to be observed that all this data is handled by the DMA module while the CPU is idling. This time can be used to perform other important tasks.